We offer a wide variety of trash and recycling services to businesses and commercial customers. Below is a list of containers Van's Sanitation has to offer for each customer's needs. 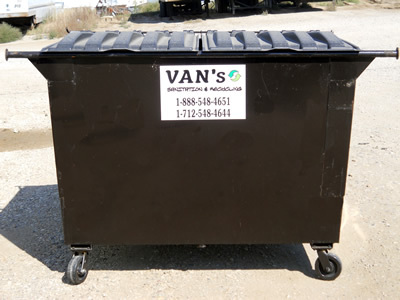 For pricing and more information about getting services started for your business, please click here to contact Van's Sanitation to discuss your needs. Self-contained compactors: Handles waste that has high liquid contents, as well as mixed and dry waste; such as, cafeterias, supermarkets, shopping centers, hospitals, etc. Stationary compactors: Handles waste that has little (or none) liquid; such as retail stores, manufacturing facilities, etc. Stationary compactors may also be used for large quantities of recyclable materials (i.e., cardboard or paper).